Last weekend when my wife and I made a trip up to Bangkok we met one of my long time friends Q, who lives there. 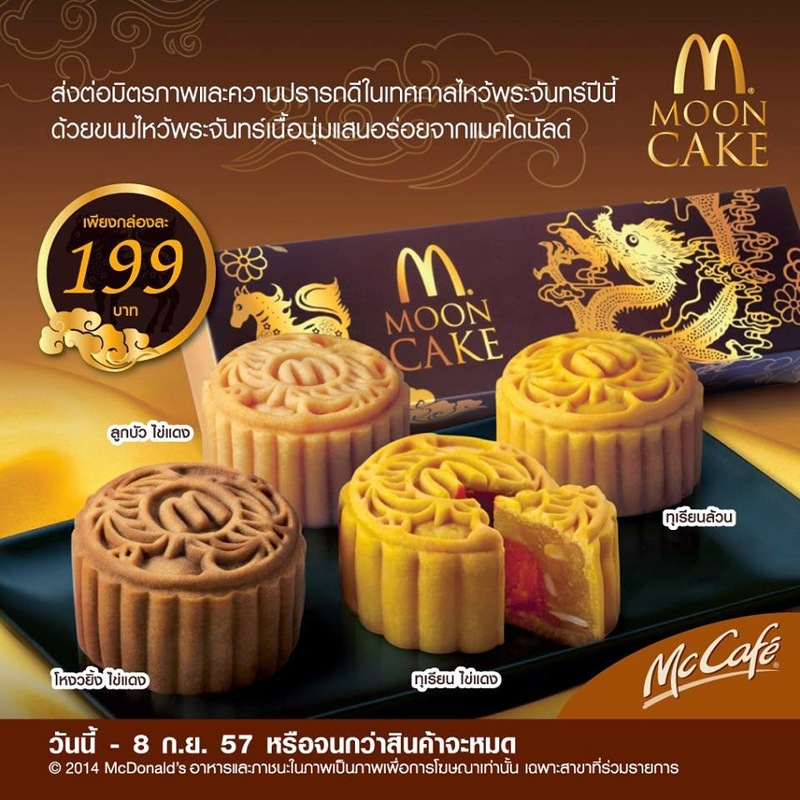 A couple months ago I saw that McDonald's Thailand started selling Mooncakes for the mid-autumn festival. It looks like this is the 2nd year in a row they've been selling them. I knew that there weren't going to stay on sale until we arrived, so I asked him to pick up a box for me and keep it safe for me until we arrived. Thankfully Mooncakes (not just McDonald's) are packaged in an airtight packet, and usually have a couple months shelf life so it wasn't any problem to keep them for me. A couple days before leaving for Thailand, I had an email from a reader that wanted to meet, and when he heard I was going to have McMooncakes, he wanted me to bring them to try together, so they made the trek back to Singapore before I could give them a try. The $6USD for 4 cakes is very cheap by mooncake standards, these are widely considered as a delicacy and are usually made by 5 Star hotels and some boxes of 4 can be $50 or more. Although my wife and I are not Chinese and never grew up celebrating the mooncake festival, I was interested to see the McDonald's take on this traditional item. The four flavours consisted of the 'traditional' Lotus Seed with Salted Egg, and the slightly more Thai flavours of Ngow Ying (mixed nut), and two Durian variants, with and without Salted Egg. Now, I'm far from a mooncake aficionado, so I might not be the best person to compare them to higher price point mooncakes, but I can judge them solely on the flavours they contained. I'll go through them in the order that I tried them in. The 2nd and 3rd flavours I tried were the Durian Mooncakes. The were essentially the same thing, but one contained Salted Egg yolk, and the other didn't. I found out from my Thai friend, that although these are traditionally a Chinese delicacy, the Chinese Thais made their own Durian version, which remains the most popular Mooncake sold in Thailand. I might be wrong, but I don't think Durian variants are that popular outside of Thailand. From as soon as we opened the box, you could definitely smell that there was something with Durian there. According to the ingredient list, each cake was about 50% Durian, with the other primary ingredient being Lotus Seed Paste. Readers may remember my encounter with the Durian McFlurry, and although I'm a big fan of smelly food (Anyone want Korean Dead Body Soup for dinner? ), I've never been a fan of Durian, and these were no exception. I will admit that these did have a nicer and smoother taste than the Durian McFlurry. The eggless Durian cake was something that I didn't enjoy, but I could have stomached it if I didn't have other cakes to eat. I thought the Durian with Salted Egg was absolutely disgusting though, the salty egg yolk just made it gritty and tough to swallow. Also, the scent of old egg yolk is not a good combination with the already strong Durian. Last but not least was the Lotus Seed with Salted Egg Mooncake. This would be considered by many to be the most "normal" flavour in the box. I went into this one expecting the worst, I still had overpowering Durian aftertaste in my mouth, and I was not looking forward to having another mouthful of salted egg. Whereas I really enjoyed the nuttyness of the Ngow Ying, and quite disliked the Durian this, rather expectedly, was pretty middle of the road. Again, I wasn't a fan of the salted egg centre, but at least it wasn't overly sweet. I've only had Lotus Seed Mooncake in Singapore once before I felt it was overly sweet (compared to the others I had in Hong Kong) and I wasn't a fan. Once I picked away egg centre, it was an enjoyable cake, but since I was already full from the other cakes. You really do have to feel the heft and weight of these, they are unbelievably dense (and calorific) I just couldn't stomach down another piece right before dinner.